According to fresh research, early humans could never have come into contact with the giant carnivorous 'terror bird' Titanis walleri. It had been thought that the fearsome beasts became extinct as little as 10,000 years ago - a time at which humans shared their North American habitat. But in 2006 a US team revised that date to about two million years earlier. The study was published in Geology, managing also to shed light on the flightless birds' migration to North America. 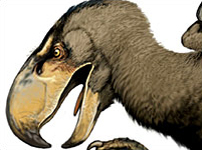 T walleri is thought to be the largest species of the terror bird family. It would have stood two metres tall (seven feet) and would have weighed 150kg (330lb). This flightless species, which inhabited South America primarily with an extension into North America, had an enormous beak and lived up to its terror tag by being a top predator of its time. The researchers looked at fossils of the birds that had been uncovered in Florida and Texas. By analysing the distribution of a group of chemicals known as rare earth elements within the bones, the team was able determine the age of the North American remains. Previously, scientists had believed that Titanis became extinct about 10,000 years ago, according to Professor Bruce MacFadden, a palaeontologist at the Florida Museum of Natural History and lead author of the Geology paper. This would have coincided with the mass extinction of other megafauna which occurred in North America at the end of the Pleistocene; a period of biodiversity loss which has sometimes been blamed in part on humans and their novel spear technologies at the time but which was largely caused by the end of the most recent ice age and the rapidly changing climate. 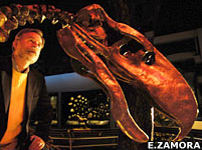 But analysis of fossil bones found in the Sante Fe River, Florida, which were thought to represent the last known T walleri, suggested that the terror bird had disappeared long before this. The last occurrence of Titanis, as far as could be estimated at the time, dated to about two million years ago. It didn't persist into the last ice age. Dating for another fossil in Texas - the earliest known example of a terror bird in North America - also yielded a surprising result for the team. Most researchers thought the big bird had migrated from South America to North America after the two continents had become connected by the Panamanian land bridge about 3.5 million years ago. However, based on the new chemical dates that were established by the team of researchers, that previous hypothesis was no longer correct. What they now believed, based on the age of the Titanis from Texas, was that Titanis dispersed from South America into North America about five million years ago, significantly earlier than the land bridge formed. The researchers did not yet know how the flightless beast could have crossed unconnected continents. Did it swim across? Or did it raft across on some kind of debris? There were a series of closely-spaced volcanic islands at the time, which now form Panama, so perhaps it swam from one island to another - pure guesswork, of course.